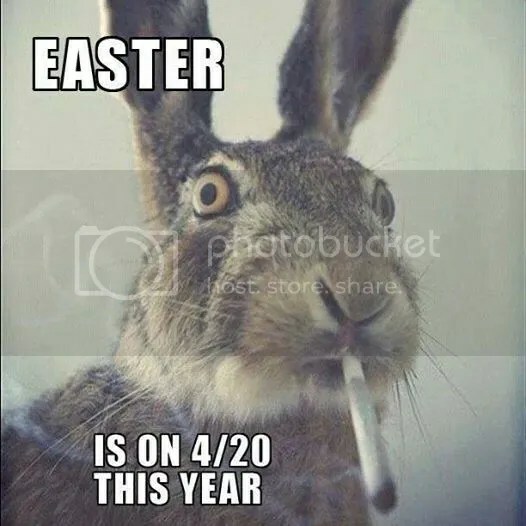 Easter is on 4/20 this year… What are YOU Doing? | What's it Like? Easter is on 4/20 this year… What are YOU Doing? I couldn’t help but mention this little tid bit to anyone celebrating Easter this year. What are you doing? I make a day out of 4/20, and have been for years. I usually go to the glass shops and look at the sales, I smoke a lot of ganja and try to chill with as many of my stoner friends as I can. Stoners Unite! I’m thinking about publishing a Stoner Easter DIY Easter basket… I’ve got ideas running through my head. If you think this would be a worth-while post, give me your input! Criticism always appreciated.